I've started making a map using a slightly altered modern political annual style. I changed the borders from the original style. I'm using different fonts too, to give it a fantasy setting. I really like this. 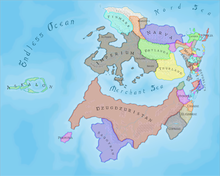 I do like "simple" world/regional maps. It allows the user to expand on details later and not feel bound to an idea they had but have since disregarded. Looking forward to seeing where you take the map next ! Nice shape and good choice of font. Fonts used : throrian commonface and priory. The idea is to add forests and deserts , provinces and cities. I really like this too! The shape is very believable, the regions are very clearly and eyepleasingly labeled. I dig it! Excellent idea. That makes it look nicer , thanks a lot man! 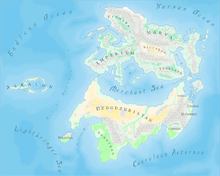 I re-did this map but in the Fantasy Worlds style this time. I used the map border from last year october annual. I loved your map. I will exactly try the fantasy world style to do the terrain of my other project. Lets see if it goes well. Ah very nice! Was planning to do a world map myself, now I'm really in the mood to make one. Good stuff Moskva. My favorite are the Askalon Islands. @Clercon : This is simply a great style and since most style focus on a regional scale there aren't that many alternatives. @Mateus: Looking forward to that, keep in mind that you can change the mountain ranges using the reshape>mirror. That gives you lots of extra options. You can try using a 2nd coastline (on a different layer) to split continents and then trace those shorter coastlines but I think that wouldn't help much on your map. I had to do it on on the eastern part of the northern continent to do all those small countries quickly. On the southern continent is just removed a lot of nodes to speed things up.